So Paddy is a year old already and what a week it's been! It's incredible how quickly Paddy has grown up and the way he's fitted into our family. But the rewards are simply incredible. Paddy is brilliant. One minute paddy was this cute bundle of snuffling fluff curled up on my knee, just a mere slip of a thing giving out little pupper snuffles, now he's lying on top of me I'm gasping for breath with cramp in both legs forcing air into my lungs like a panicked diver out of oxygen. At at twelve months old is a 'big lad'. He's bigger than Max as they sit side by side, he's even the the same weight (23.5kgs) and still growing and a lot more filling out to do too. More cramp and bruising from inappropriate zoomies round the house. Thankfully Paddy seems to have taken on Max's air of calmness in public places, yes he gets excited at times but he's a very good boy, unless you are a soft toy with a squeak, then look out your history. Come to think of it, when you look at how many people Paddy has met and the situations we've put him in over the last 8 months, he's done amazingly well and we are immensely proud of him. To put that into perspective on our charity walks alone its over 1200 wonderful people and their furry companions. The Padster has very distinguishing markings, a horses head on the back of his neck and his hind legs, one's white and the other brown. He gets lots of comments about this. His brown leg looks like an Ugg boot with a fluffy furry brown lining. Brown fur also seems to grow faster making his white leg look really thin from behind. It was with great pride though (and even warranted a phone call home) the first time Paddy cocked his leg. Walking down to the lake, Ugg Boot lifted up and hey presto. Okay his aim still needs working on as he peed into thin air, his laser targeting was somewhat off but I'm sure he'll get his target calibrating equipment sorted very soon. It does make me laugh when his leg shoots out like an indicator and he's tottering like he's on a tightrope. At twelve months it also marks the end of and era. 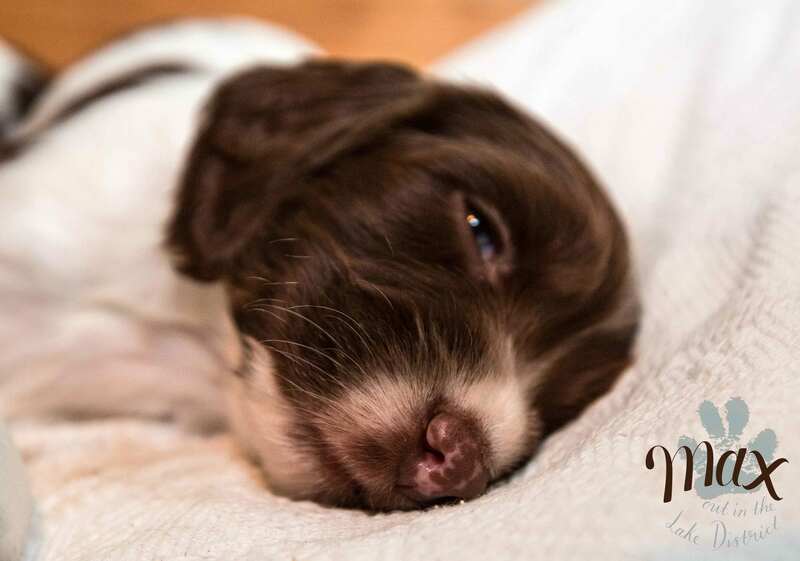 Paddy has been fed Acana Heritage Puppy and Junior from 9 weeks of age and it's fair to say it's given him a amazing start to his very 'energetic' lifestyle. If you are looking for a recommendation for a puppy food this would be it. It has done the boy proud. We've monitored Paddy's weight weekly through our local vets (Thank you to Millcrofts vets in Keswick for our weekly Tuesday morning weighing session) and also speak with Jenny the lovely nutritionist at Bern Pet Foods monitoring Paddy's growth rates and also the very smooth transition onto 'Big dogs food'. Paddy is now being fed Acana Regionals Wild Prairie which is 70% meat and he loves it. You can read all about it by clicking your paw on the links below. So is Paddy a pup still or a big boy now? I think of him as 'the pup' and will do for a long time. The feed is doing well, Max looks amazing and is full of life, even more so near water, must be the fish and for those that ask - I've always fed the feed dry but they always have access to fresh water. I'm pretty sure it's better for their teeth, keeping them clean etc. It's really interesting to discuss nutrition on a 'one to one basis', Jenny and all the team at Bern Pet Foods are as passionate about my dogs as I am. To me that speaks volumes. Paddy's coat has an amazing healthy shine, although at the moment of writing he is drying out after he 'fell' into the Thirlmere this afternoon. One trait he's obviously learned from the Jedi Max'ter. Friday 9th March and Saturday 10th March. More details to follow. So please come along and meet Max and Paddy! Hopefully in May we will be off to Scotland driving up to Fort William, then clockwise round by Mallaig up to Durness, round to John O' Groats then down the East coast. We will be in our very dog friendly 'Bedouin Van' so if you have recommendations on things we must see or campsites with beach views and other great places to stay or where eat please let us know. Please send us a direct message! We are also planning on a trip to Snowdon and later on this year heading down to Devon and Cornwall so hopefully may even get to meet some of you. We like mountains water and beaches and cake!